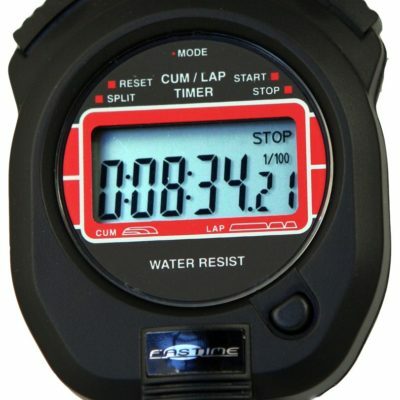 Fastime 26 Stopwatch with 500 Lap Segmented Memory Quad display. The data is downloadable to a Windows based PC. Large digits, EL Back light and a robust water resistant case with a rear battery door making it easy to change the battery. The buttons are ergonomically designed to give a positive action. The watch comes with a 1 year warranty. 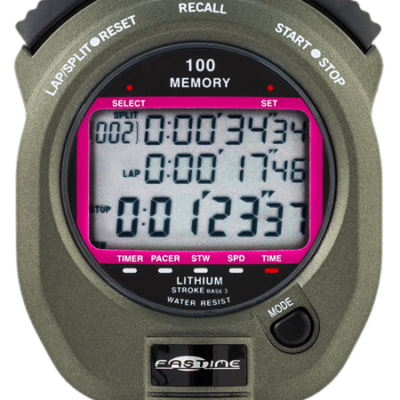 The Stopwatch uses a CR2032 Lithium battery. 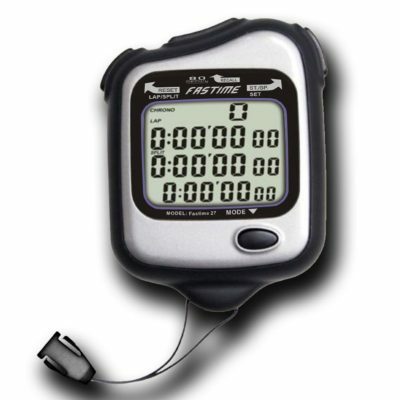 Functions Include: Stopwatch, Dual Countdown Timer, Pacer, Time of Day/Date, Alarm. Data Upload to PC. 500 recallable Cumulative and lap split times can be stored in the memory. Best, Slowest and average Lap Times are also shown. Data can be stored in segments. So if you have a series of events, with a number of split times in each event, you can store each events split times as a block. Data can be uploaded to a Windows based PC. USB cable and Software is provided. You can then review and analyse all the cumulative and split times data.